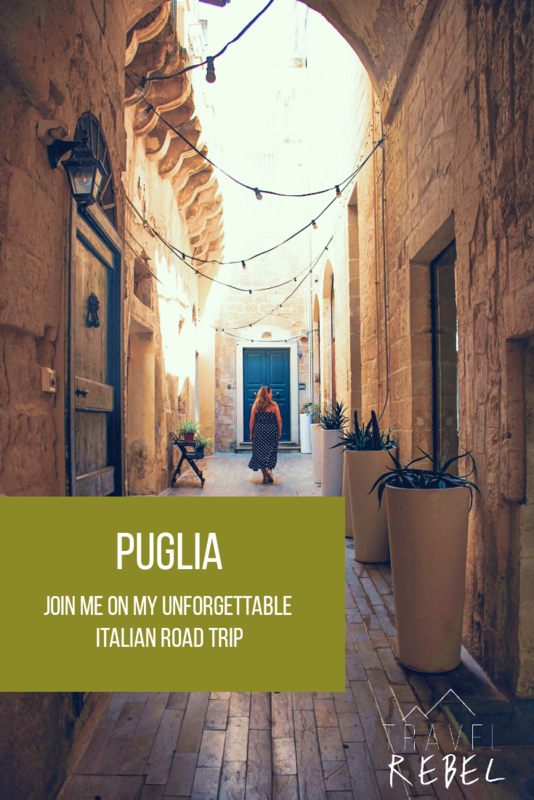 And I’m back with the rest of my Puglia details. 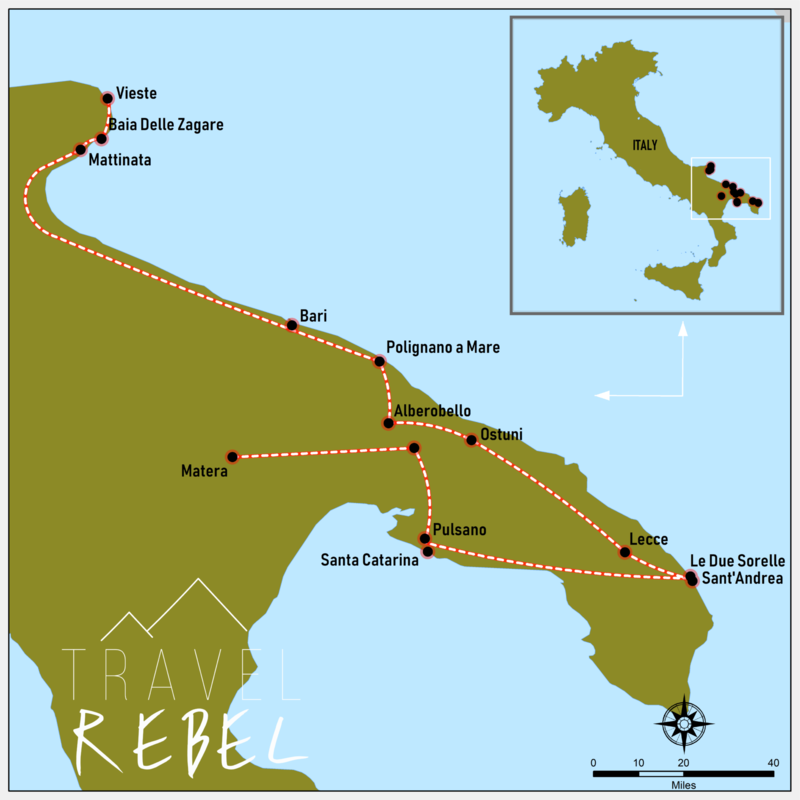 Just like part I , this blog is also jam-packed with information that will hopefully make it easier for you to plan your very own Italian adventure… or, at the very least, make you brush off the dust from those suitcases. Santa Caterina is a beautiful seaside resort where you will encounter very few foreign tourists. Here, you can go wreck diving or simply enjoy the rocky beaches. We decided to have lunch at La Pergola near the beach. Luckily, some kind Italians recommended two fantastic dishes: Risotto alla crema di pesce and pasta with crustics. Utterly delicious! Our home away from home during our month long road trip through this magnificent country was Pulsano. 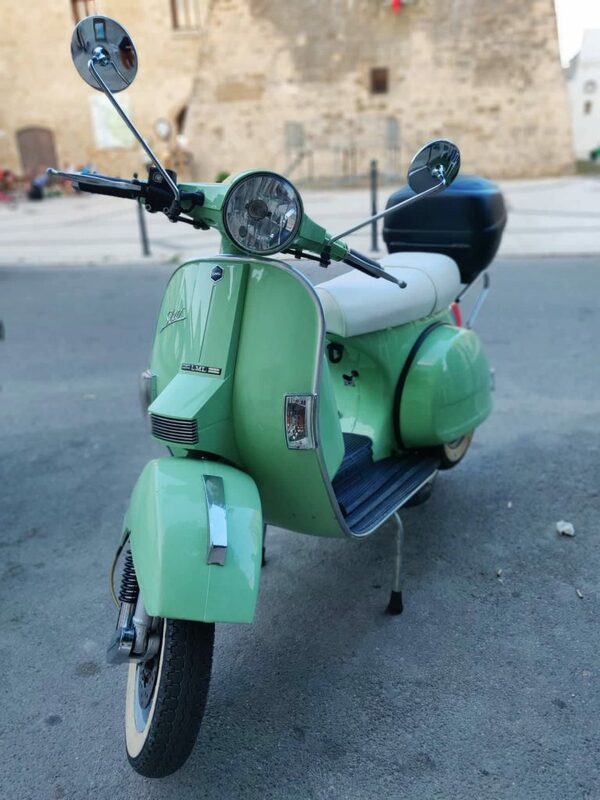 It is an unknown authentic village in Puglia where you can quietly observe the real local atmosphere and lifestyle of the Italians. Needless to say, I loved it. Upon arrival, we were warmly welcomed by the very charming host Jacopo of the B & B Il Vicoletto. We were the first Belgians in his B & B since it opened in March 2018 and there was a bottle of wine waiting for us in our fridge. This place is just around the corner from the central square, where there seems to be a village party every evening. During out time here, we ate at the Il Re Della Brace twice. This place boasts a huge outdoor terrace and a giant olive tree. You get to choose your meat and it’s immediately cooked on a huge bonfire. There are many options for salads, vegetables, fries, etc. For a total price of just EUR 19, we had huge servings of meat, veggies, fries and drinks for two. Our breakfast experience was typical Italian: mini espresso and gigantic sweet cakes. This is when Jacopo came to the rescue again — after a short consultation with him, we received giant slices of fresh fruit in the morning instead. Yay! 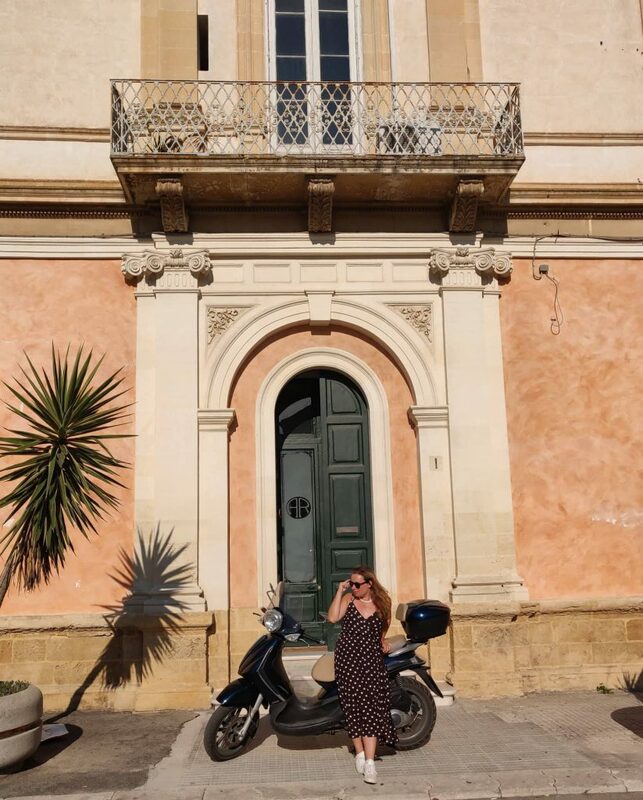 Lecce is a magnificent city where Baroque architecture reigns supreme. When we were here, it was very hot (about 40 °C… yikes! ), so all we saw on the streets were other tourists desperately looking for shade. Regardless of the heat, there’s quite a bit to see here, especially for those Baroque enthusiasts. Do check out the Church of San Giovanni Battista, the Piazza del Duomo, and the Roman amphitheater. Le Due Sorelle, also called the ‘two sisters rocks’, was a typical tourist-run ombrellone beach. You know how I feel about touristy places, but this one is certainly worth a stop. I can’t deny the postcard-perfect beauty and the upbeat atmosphere. Oh, and where does the name come from? Well, legend goes that two sisters dove into the rough currents, but shortly realized they wouldn’t be able to get back to the shore. The gods then turned them into these stunning sea stacks, to be admired forever. Less crowded and a bit rougher than Le Due Sorelle, this was another nice place to jump from the rocks into the mesmerizing azure water. The beach is framed by majestic cliffs and the sand is white and pristine. There were a lot of visitors here, too, but then again it’s summer in Italy! Water, sun and fun are really the best combo. Rest assured, there were plenty of places to park nearby. Originally, we weren’t planning on stopping in Matera, but I am so happy we decided to drive around. This place is all set to be cultural capital of Europe in 2019 and let me just say that this tag is certainly not unjustified. As you walk breathlessly through the tangle of old streets in this completely car-free area, you will literally feel the history engulf you. It’s a feeling like no other. The town is known for its cave-dwellings known as sassi. Visitors adventurous enough can even stay in these caves. 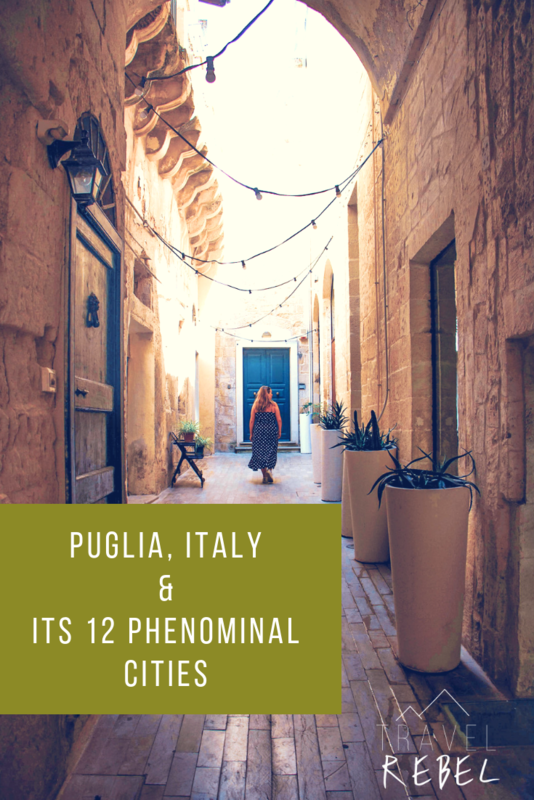 Some believe that Matera may be the third-longest constantly inhabited human settlement in the world… let that sink in. The first inhabitants probably came here around 7,000 years ago. Do check out the Museo Nazionale Ridola which holds exhibits from distant eras of Basilicata’s history. 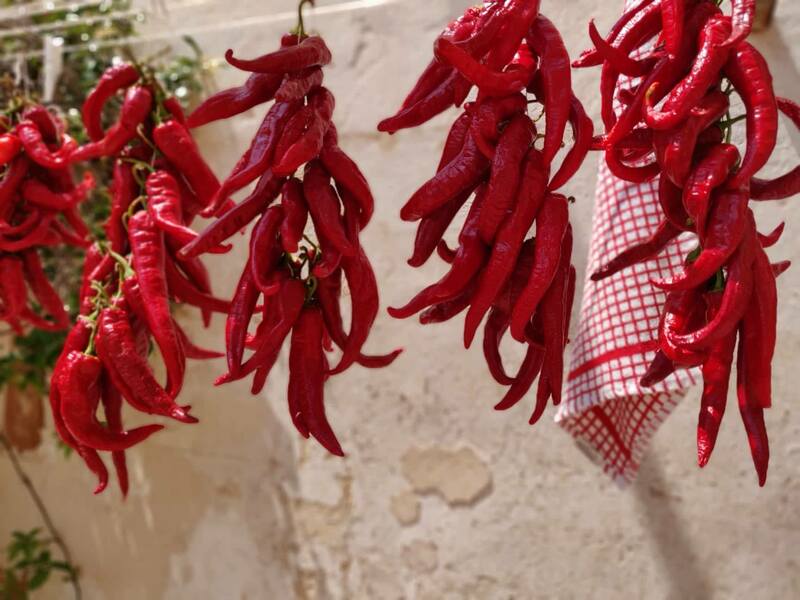 Because the sassi are so extensive, you might want to book a tour to get the full experience — also, a bit of historical context provided by a local can make all the difference in Matera. A visit here is truly like stepping back in time. So that’s what our long Italian road trip was like. In my opinion, it had just the right amounts of adventure, history, relaxation, and exploration. Would I do it again? In a heart beat. 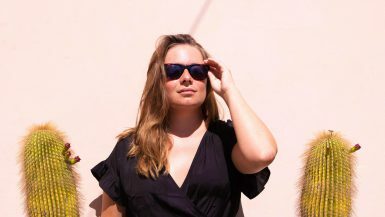 This site can be a walk-through for all of the information you wanted about this and didn’t know who to ask. Glimpse right here, and also you’ll undoubtedly discover it.